This is a very nice hotel. It was big, but parking was close and convenient. We enjoyed our stay despite the occasional noisy airplane. Airplanes flying over were noisy at times. The hotel was in a great location with plenty of parking, just minutes from downtown. Other than the lobby construction, the hotel was fabulous! Very nice and clean great bed! The hotel was very close to the Airport, for those traveling by air I believe this would be quite nice. Currently the hotel is being Renovated. It was not loud or anything like that, so I did not find it to be a nuisance. I would stay there again. I liked that the hotel pool/hot tub was open until 11 on Friday/Saturday. The price was good! I did not like that the hotel was under construction but it was quiet. 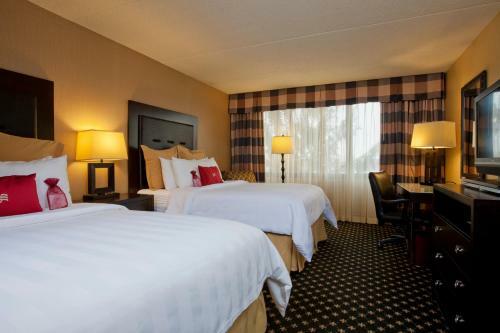 The Holiday Inn Select Airport Indianapolis is a five-storey hotel located directly across the Indianapolis International Airport, and 8 miles from downtown Indianapolis. 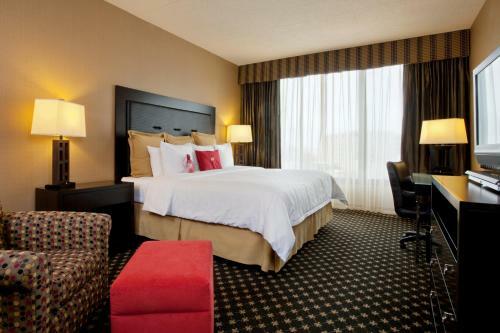 The hotel features modern furnishing and facilities, including a conference center and versatile conference space. Breakfast is available at The Bakery, which offers freshly baked muffins and Danish from 5am, and at Café Grill, which also serves casual meals for lunch. Catch up on sports on multiple televisions screens over a meal at the Bench Warmers Sports Bar & Grill, or enjoy fine French cuisine with wines for dinner, accompanied by a strolling violinist at The Chanteclair. Attractions near the hotel include the Indianapolis Zoo/White River Gardens 6 miles away, and the Eiteljorg Museum 7 miles away. 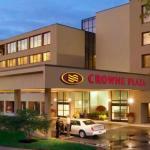 Retail outlets at Circle Centre Mall, golf courses and the Indiana Convention Center are about 8 miles from the hotel. Located 12 miles away is the Childrens Museum. 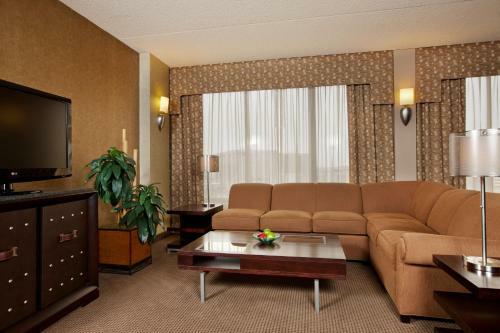 Holiday Inn Select Airport Indianapolis offers 272 rooms and seven suites. All rooms have satellite television with pay-per-view channels, complimentary local calls on two telephones with voice mail, full refrigerator, separate hanging closet, work desk with lamp, iron & board, complimentary high speed Internet access, coffee/tea maker, daily newspaper, and daily housekeeping. The attached bathroom has hair dryer. Room service is available during designated hours. Administrative services, personal computers, and high speed Internet access is available at the Business Center. Twenty-eight meeting rooms equipped with audio visual aids can accommodate 600 (maximum) for conferences and seminars, and are staffed by seven sales and meeting professionals on-site. Work out at the Fitness Center; take a dip at the indoor pool; relax in the sauna, Jacuzzi and whirlpool; or sharpen your reflexes at the Game Room. Valuables can be kept in safe deposit boxes at the front desk, which can also assist with dry cleaning/laundry pick-up, porter/bellman services, and airline ticket purchase/car rental. Other facilities available on-site includes a gift shop, cash machine, and ice machine. While the rooms are well-appointed and well-maintained, guests feel that the public areas are a little dated. 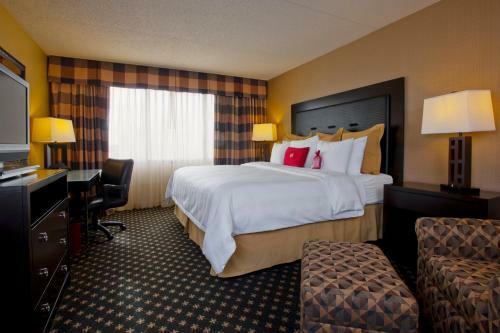 The hotel offers a complimentary shuttle service to the areas in the vicinity of the hotel, as well as a complimentary 24-hour shuttle service to and from the Indianapolis International Airport.